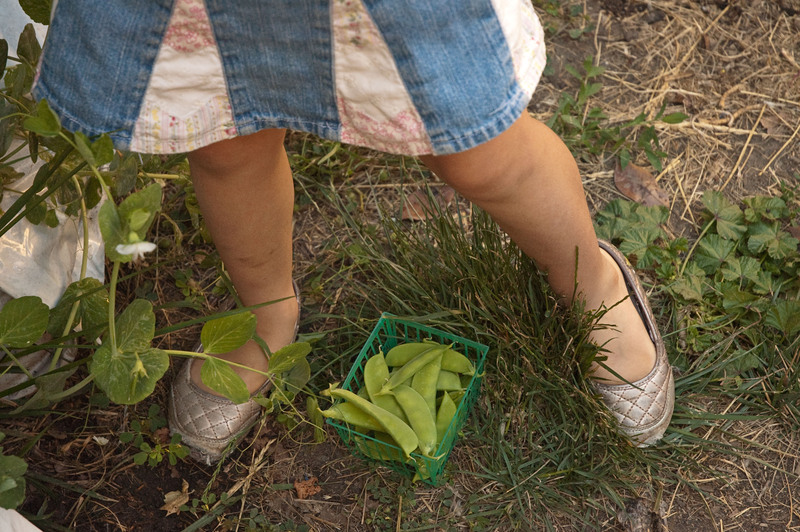 “Mom, can I pick some peas too?” The pea vines in front of me begin to tremble. 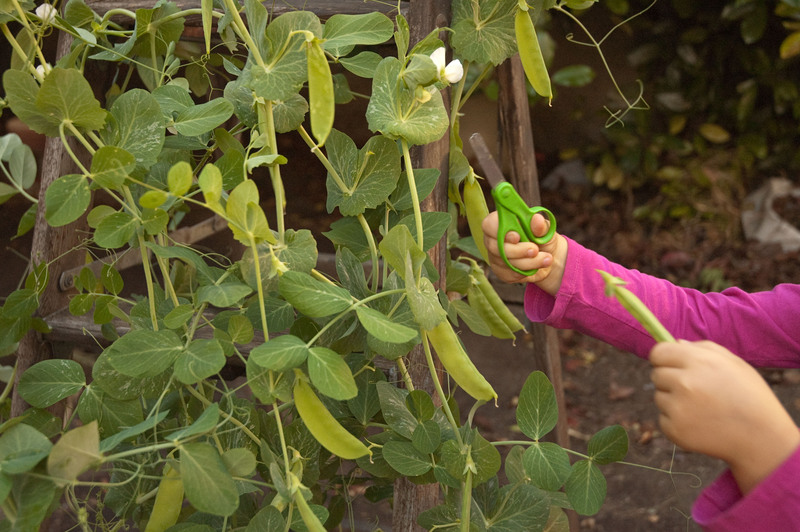 I look down to see her tugging on a pea pod, pulling the whole vine to one side. Out last rainstorm of the season (I hope!) was immediately followed by a several hot muggy days, the combination of which resulted in an outbreak of powdery mildew in my pea plants. 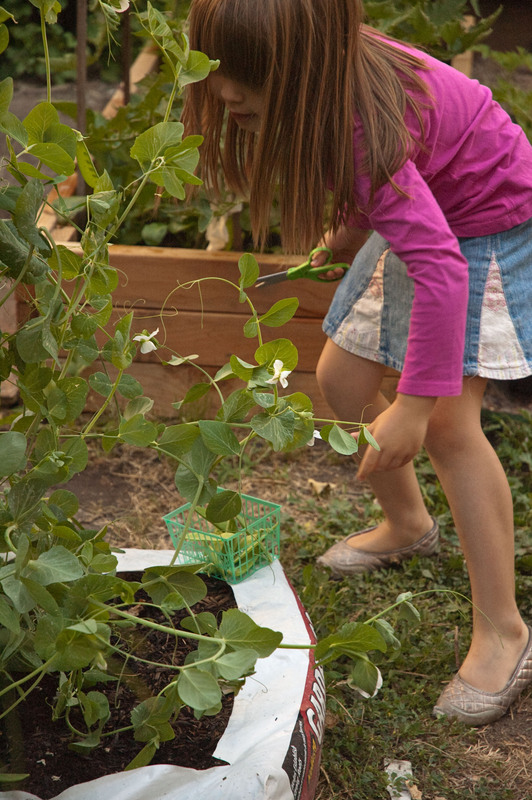 We decided it was best not to risk exposing the melon and cucumber seedlings so instead of treating them with a homemade concoction of baking soda and water, we harvested what peas were left and pulled all the plants out. 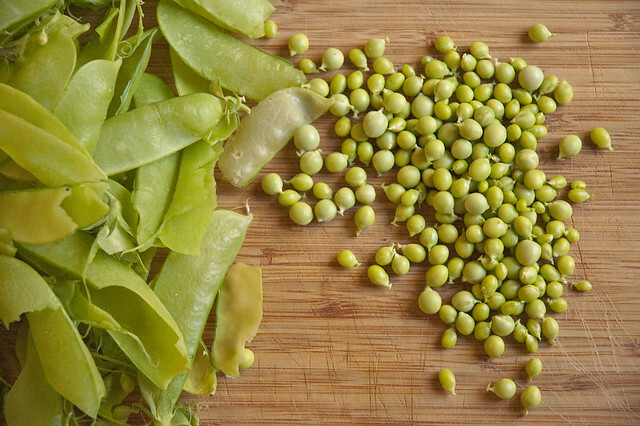 Total pea harvest came to just under a pound. Disappointing yes, but lesson learned. Next year we will be ready when mildew hits. The next morning I went out to do the morning’s chores. This time I noticed black spots covering the lower leaves of my potato plants. 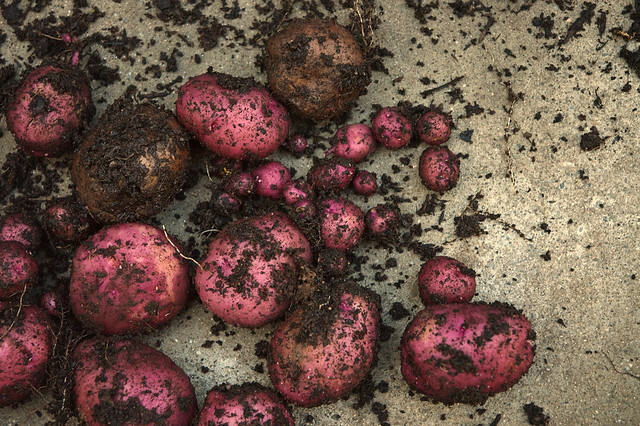 Panic flooded my body and I rushed the potato pots to the other side of the yard desperate to keep those diseased monsters as far from my precious heirloom tomatoes as possible. Blight. Even the sound of that word gives me the willies. Blight is a highly contagious fungal infection, a disease that hits like a blitzkrieg killing entire crops in a couple of weeks. Blight is what killed off the tomatoes from my first garden in college. Ever since then I have been careful to prevent it from infecting my garden again. A year after the Great Irish Famine in 1845 the whole family boarded a ship to Philadelphia. I cannot imagine the choice they had to make. To choose between your starving homeland or to take a bold leap and change your fate. To board an old creaky ship, sail across the Atlantic and make a new life in a new country. I think if I lived back then I would have made the same choice. Yes, the fear of blight must be in my blood. After chopping off all the infected leaves I shoved them into a plastic bag and dumped the first bucket of dirt onto the patio. 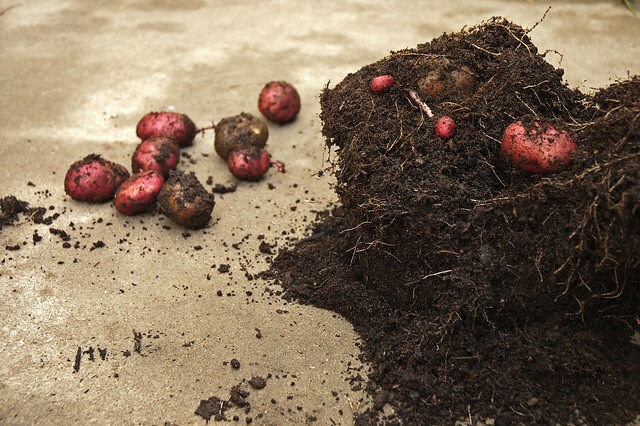 When I saw a large red potato sticking out of the dirt I practically jumped for joy. It worked! If it wasn’t for the damn blight I would have had an awesome harvest. 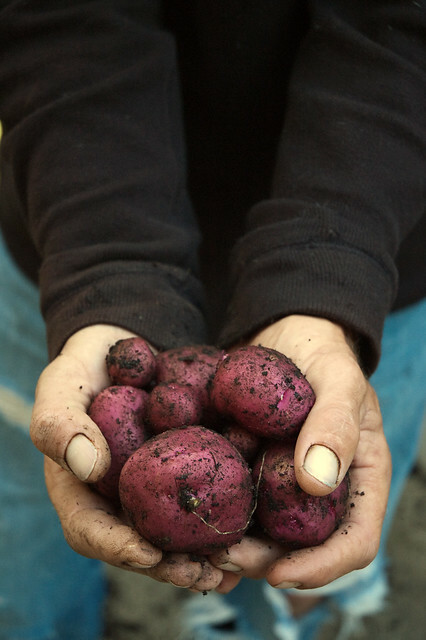 Potatoes are definitely on the must grow list for next year, along with careful blight prevention. 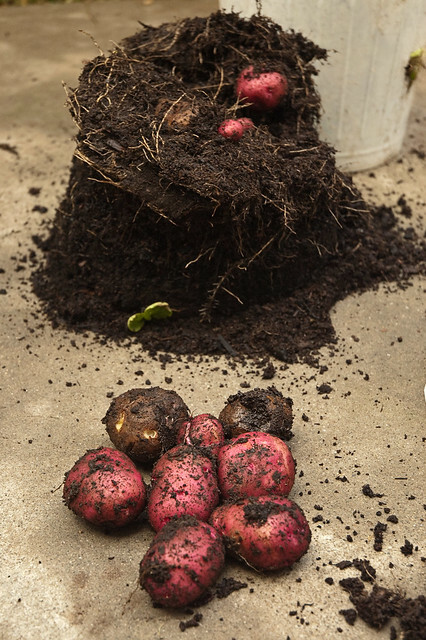 Total potato harvest: 2 lbs, 12 oz. Crappy. On the bright side, they are the best freakin potatoes I have ever eaten. Not sure how or why, but these babies are so creamy and soft when roasted that all the work growing them was worth it. I went in search of summery recipes and came across one for Peas and New Potato Salad in The Garden Fresh Vegetable Cookbook by Andrea Chesman. 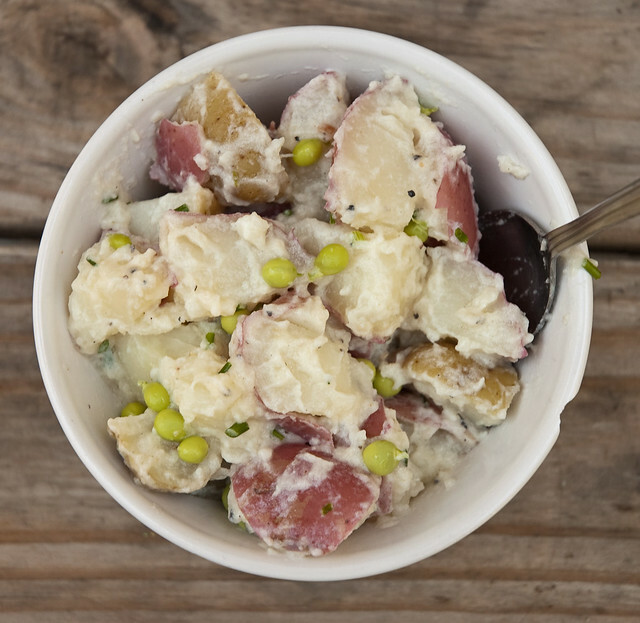 Most people hate potato salad, myself included, but it’s still the one dish guaranteed to appear on the table at every summer BBQ & picnic in America. There are always leftovers because it’s usually disgusting and, if left in the sun, it will make your guests sick. It’s one of many mayo/cream laden dishes from the 1940s & 50s that just wont go away. So, I guess we need a new era of potato salad. I swapped the sour cream in Andrea’s recipe for tangy plain yogurt and marinated the potatoes overnight in Italian dressing, a trick I picked up from my aunt. Apparently my grandmother insisted that this was the key to a great potato salad. 1. Fill a large pot with water and a large pinch of salt. Bring to a boil. 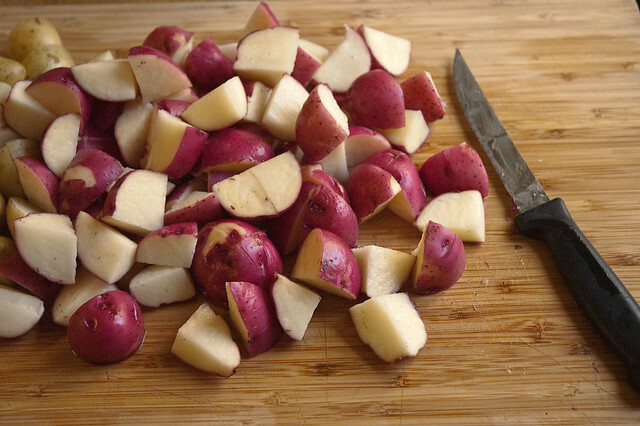 In the meantime wash and cut the potatoes into bite size pieces. When the water is boiling carefully add the potatoes to the pot. 2. While the potatoes cook prepare the dressing. Mix the yogurt, chopped scallions and thyme in a small bowl. Cover and refrigerate. 3. When the potatoes are cooked through, but still firm, remove them from the water and rinse with cold water to stop the cooking. Let the potatoes cool to room temperature then add the Italian dressing. Toss to coat completely. Cover and refrigerate overnight. 4. In the morning, give the potatoes a quick stir then add the yogurt mixture and toss to coat. Sprinkle with more chives, salt and pepper. Return to the refrigerator for at least 30 minutes for the flavors to meld. Serve cold and garnish with chives, chopped scallions or chopped pickled radishes. This potato salad is just my style! Out with the mayo! 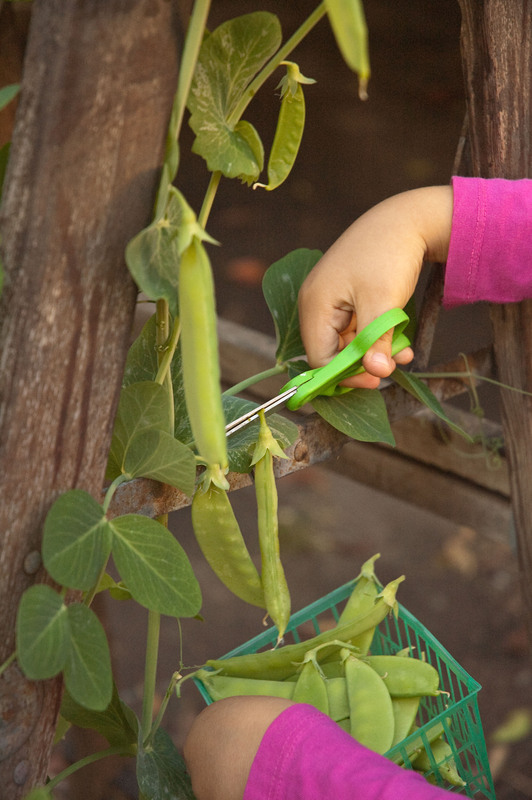 I loved reading about your daughter picking the peas! We still have yet to harvest anything from ours up hear in WA, it was a cold Spring. Hopefully soon!